I've been slacking on the mail day posts lately, here is some of the freebies that I got within the past few weeks or so. I love getting fun things and love when you guys share with us your hauls as well! Temptations Snack Mouse Cat Toy - This was mail-in offer when you bought and submitted 4 Temptations pouches from products. It includes two Snacky Mouse toys (that you fill with the Temptations treats in hopes that your cats will try and get them out of the little slots) and a bag of Temptations treats. I sent in my request back in the summer and forgot all about it so it was nice to finally receive it. My cat hasn't been too interested in it yet, she is a bit of a fatty so she just likes treats in her bowl and doesn't want to work for it! 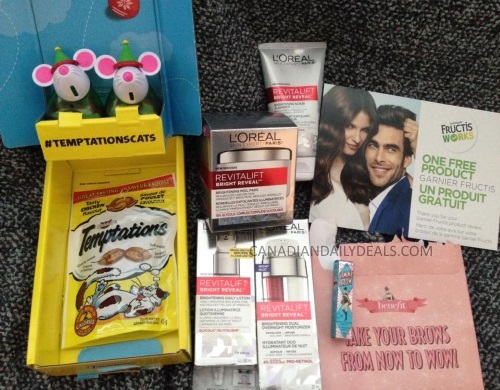 Loreal Bright Reveal Influenster Voxbox - Awesome box from Influenster to trial some of the new Loreal Revitalift Bright Reveal products! The box came with four full-sized products including a brightening scrub cleanser, brightening daily lotion, brightening dual overnight moisturizer and brightening peel pads. This was sent to me for free as part of their skincare campaign, click here for more info about this campaign and to sign up for Influenster if you aren't a member yet. Benefit Gimme Brow - This freebie from Benefit during a sampling program that they had through Topbox includes their Gimme Brow eyebrow gel that acts to sculpt and set your brows with tiny fibers. I've been using this product for years but Benefit recently repackaged all of their brow products. I love how small and cute this is. They gave away 3 different products, I think they chose randomly which one you got. Garnier Free Product Coupon - I received this Free Product Coupon as a thank you for reviewing their product samples earlier. It is good for one Free full Garner Fructis sized product of my choice (coupon is valid until December 31, 2016). What did you get in the mail lately? Share with us our Facebook Page.